Have any pressing gardening questions during the winter, like how to de-ice your lawn after snowfall? WTOP Garden editor Mike McGrath has you covered. Mike will appear on Saturday, Feb. 23 and Sunday, Feb. 24 at the Capital Home & Remodel Show at the Dulles Expo Center in Chantilly, Virginia. Too late by two or three months, Barb. The ideal time to plant — or replant — bulbs such as crocus, daffodil and tulips for spring bloom is after Halloween but before Thanksgiving. 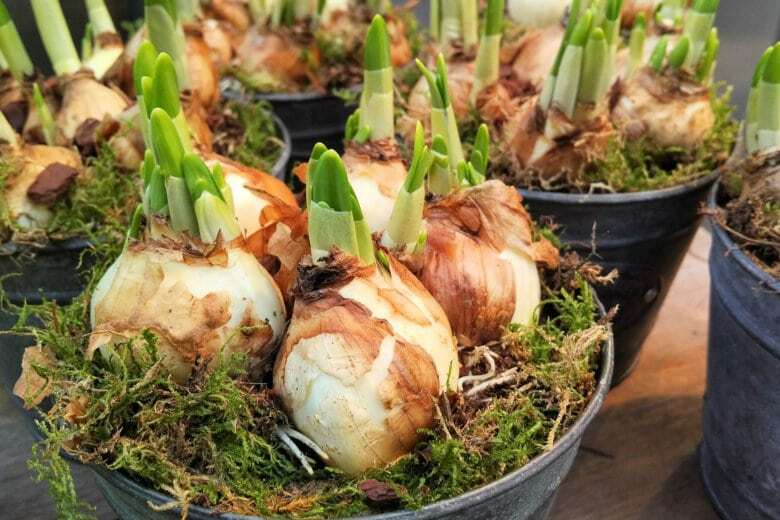 That gives the bulbs some time to put down good roots before the ground freezes hard, but not so much time in the ground that weird weather swings might get them to sprout prematurely and ruin the springtime show. Let them pop up where they’re planted this spring, wait until their greenery starts to fade and then transplant them to the place you’ve now decided they should be. No, spring is not the ideal time of year to do this, but you’d never find them in the fall. But do remove their ‘tarp’! In our last thrilling episode, “Procrastinating Barb” near Glen Burnie asked about moving her spring bulbs. Of course, the answer is no — she needs to wait until after they bloom in a few months. But the question led me to take a close look at my bulb beds and I saw exactly what I feared: a whole lot of whole fall leaves plastered over the surface of the soil. The region had freezing weather, snow, rain and a plague or two of locusts while some of the leaves were still on trees. So even if we had been keeping up with the leaves early, the ones that have since fallen now threaten our spring bulb displays. So, wait until the next nice day — one has to be coming, right? — and gently rake the leaves away from where the bulbs will emerge. Do not wait until the shoots come up; raking after that will severely damage the display. Yews are tough shrubs that can take a pretty hard pruning, Dawn — but that doesn’t mean they won’t look nasty for awhile if you cut into non-needled wood. After you cut the most offensive inches off now, wait until the shrubs begin regrowing in the spring. Then, take another 2 inches off every couple of weeks, until the far edges of the yews are well beyond the walkway. Then, you can drop back to clipping them gently once a year or so. Spreading the work out over several months (and years) will allow you to really shape the shrubs nicely, instead of having bare branches outside your home all summer. Melt ice — not your lawn! Looks like icy weather is on the way, so let’s review the rules of safe and effective de-icing. Rock salt (often listed only as “NACL” on product labels) is the cruelest ice-buster for your lawn and landscape, but the least effective against ice when temperatures plummet. De-icing products composed of calcium chloride, potassium chloride and/or magnesium chloride are much gentler on plants and more effective on ice. And you use much less material to get the desired result. To get the most out of any de-icer, apply it right before the weather event. Never apply de-icer to deep snow. Shovel the snow, then apply the de-icer. If trucks toss salt onto your lawn, shovel it off or shovel more clean snow on top to dilute the salt. No matter what, never shovel snow or ice that’s been treated onto your lawn or landscape plants. That’s just looking for trouble.